1730: born in Kamigata. His father Matsushima Moheiji is a dôkegata. 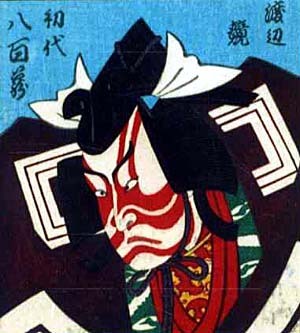 1737: first stage appearance in Ôsaka, where he plays koyaku roles under the name of Matsushima Kichisaburô. Fall 1742: Kichisaburô go to Edo, where his father settled in Fall 1740. 11th lunar month of 1742: Kichisaburô achieves a great success at the Nakamuraza, where he plays koyaku roles in the kaomise drama "Keisei Akazawayama". He is nicknamed koyaku no meijin ("the master of children roles"). 11th lunar month of 1745: Kichisaburô becomes wakashugata and plays at the Nakamuraza in the kaomise drama "Suehiro Izu Nikki", which celebrates the arrival in Edo of the Kamigata actor Fujikawa Heikurô and the shûmei of Ôtani Hiroemon II and Nakamura Denkurô II. 11th lunar month of 1746: Matsushima Kichisaburô takes the name of Matsushima Yaozô at the Nakamuraza, playing the role of Ôtô no Miya in the kaomise drama "Ame Tsuchi Taiheiki", which celebrates the arrival in Edo of the Kamigata actors Arashi Koroku I and Tsuuchi Monzaburô. 1st lunar month of 1748: Yaozô's rank in the Edo hyôbanki, tachiyaku section, is jô-jô (superior - superior). He plays the role of Honda no Jirô in the new year drama "Kazari Ebi Yoroi Soga", which is produced at the Nakamuraza. 5th lunar month of 1748: the drama "Yoshitsune Senbon Zakura" is performed for the first time in Edo, at the Nakamuraza; Yaozô plays the role of Kokingo [casting]. 6th lunar month of 1749: the play "Kanadehon Chûshingura" is produced at the Nakamuraza for the first time; Yaozô plays the role of En'ya Hangan [casting]. 11th lunar month of 1749: Matsushima Yaozô becomes disciple of Ichikawa Ebizô II and takes the name of Ichikawa Yaozô I at the Nakamuraza, playing the role of Shinozuka Gorô in the kaomise drama "Onnô Taiheiki". 7th lunar month of 1751: first Kabuki adaptation of the puppet theater drama "Koi Nyôbô Somewake Tazuna", which is staged in Edo at the Nakamuraza [casting]; Yaozô plays the role of Sagisaka Sanai. 11th lunar month of 1753: Yaozô plays at the Ichimuraza the role of Hannya Gorô in the kaomise drama "Kamuri Kurabe Yatsushi Kuronushi", which celebrates the arrival in Edo of the actor Kasaya Matakurô I. 11th lunar month of 1754: Yaozô plays at the Nakamuraza the role of Sanada no Yoichi in the kaomise drama "Miura no Ôsuke Bumon no Kotobuki", which celebrates the shûmei of Ichikawa Danjûrô IV, Matsumoto Kôshirô III and Tsuuchi Monzaburô II. 1st lunar month of 1755: Yaozô plays in the same theater the role of Soga Gorô Tokimune in the new year sogamono "Waka Midori Nishiki Soga". 1st lunar month of 1759: Yaozô's rank in the Edo hyôbanki, tachiyaku section, is jô-jô-jû (superior - superior - "ten"). Yaozô appears on stage for the last time, at the Nakamuraza, playing the roles of Soga Gorô Tokimune and Benchô (disguised as Kobayashi no Asahina) in the new year drama "Hatsugai Wada no Sakamori". Ichikawa Yaozô I was a promising and popular tachiyaku actor, who unfortunately died too young and did not reach the peak of his art and popularity. Jitsugotoshi, wagotoshi and aragotoshi roles were his forte. He was also the owner of a cosmetics shop located in the district of Yorozu-chô. Because of Ichikawa Yaozô I's popularity, a sweet shop in the district of Sakai-chô decided to make and sell "Yaozô Okoshi", some traditional cakes of sugar-bounded popped rice.